Greetings cardfighters! This week's tournament report will be on this year's Team League National Tournament (otherwise known as the Bushiroad Spring Fest). 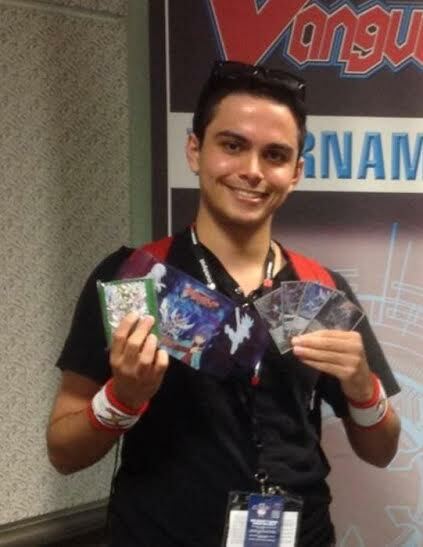 I'll be covering the winning team's decklists as well as my commentary on their deck choices in this article so do stick around! This year's winning team is Team Axios from Texas, who beat Team Fire Breathing Rubber Duckies from California. Team Axios scored in 2nd place in their state's regional qualifier earlier this year. Without further adieu, here are the names of this year's Team League National Champions. Bluish Flame Liberators are definitely an underrated deck and we have not seen much from this deck ever since we left legion format. Nevertheless the deck was overdue for a top slot and definitely deserved one thanks to some additional support from Sovereign Star Dragon. 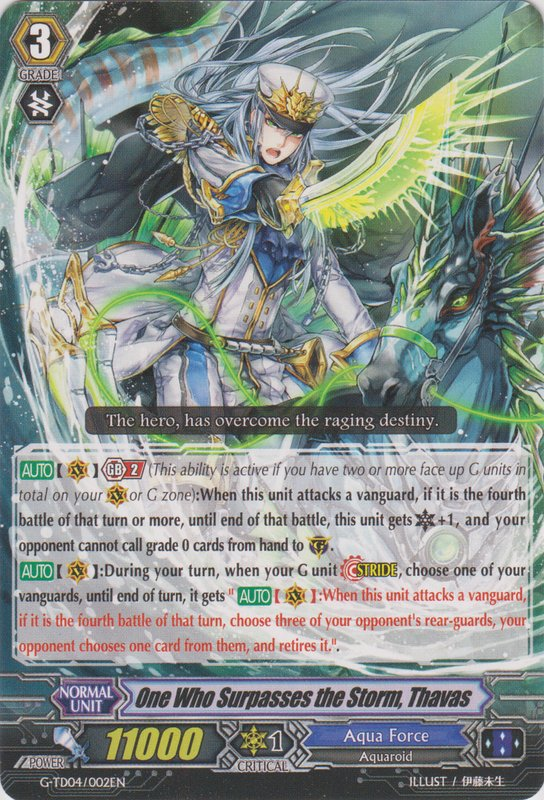 The inclusion of G-Perfect Guards helps the deck to be able to un-flip early counterblasts that were used on Oath Liberator, Aglovale. 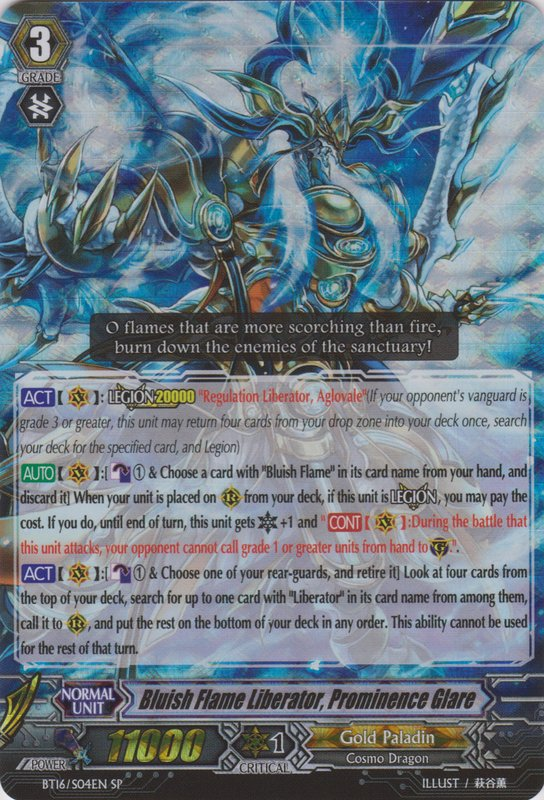 Taciturn Liberator, Brennius allows the deck to now have threatening rear-guard lanes on Glare turns in addition to allowing you to un-flip several counterblasts at once if allowed to hit, which may be somewhat likely if your opponent has to exhaust several resources to guard Prominence Glare. As for the strides, the one-of Rain Element, Madew allows the deck to stride on a legioned Vanguard yet be able to keep their Grade 3's in hand to use with Prominence Glare later, which was an issue the deck had before when trying to stride. Aqua Force has been one of the most successful clans this summer at ARG events so it isn't surprising that the deck was in the winning team's line-up. Sebastian chose the Thavas build over the Maelstrom oriented build, yet kept Glory Maelstrom as a teched in 2-of as an alternate means to finishing the game with Despina. A while back, I mentioned that Tetra-drive was a solid alternate choice in Thavas builds and Sebastian seemed to agree. Rohde was an interesting choice but I can see it working with Couple Dagger Sailor. 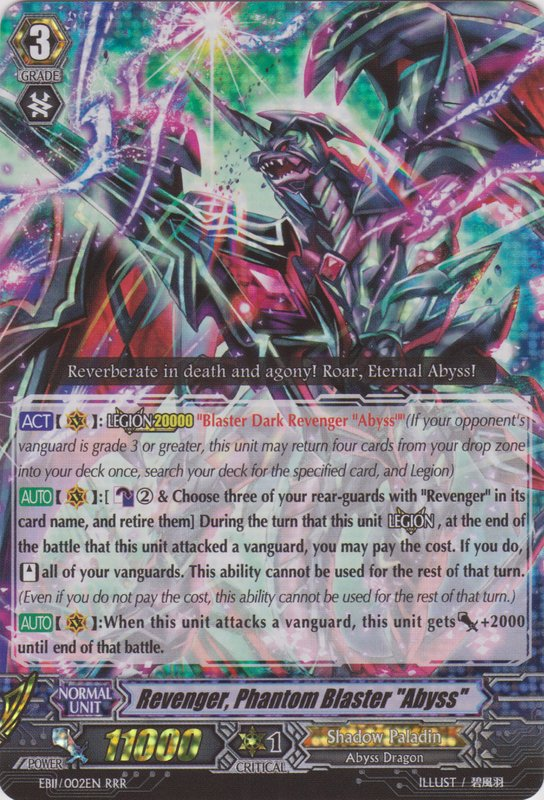 4x Blaster Dark Revenger "Abyss"
4x Revenger, Phantom Blaster "Abyss"
4x Dark Dragon, Phantom Blaster "Diablo"
Revengers are a deck I've reviewed several times by now and for the most part, everyone's lists are quite similar. The biggest thing I noticed was his choice to not run Black-winged Swordbreaker. Many people love the raw card advantages it brings with Judgebau Revenger but it is quite a weak draw, which was probably his logic. Another small difference I saw was Joseph's choice to run stride enablers, which certainly is not bad by any means. It's just less common when other Revenger players choose to play some of the other broken cards they have in their arsenal, such as Dark Heart Trumpeter. The one-of Blaster Dark "Diablo" was presumably there for the mirror match as well as versatility with Charon. Other then that, the list looks pretty standard with the Blaster Dark Revenger engine, G-Perfect Guards and Charons. But at the end of the day there is nothing wrong with using tried and tested standard lineup's and the deck did win after all! This concludes the winning team's decklists from the Spring Fest Continentals. Admittedly, continentals are a rather small tournament since only a few teams get to qualify, but it is not to be overlooked that these players were good (and lucky!) enough to get 2nd place at the previous Texas qualifier. We've seen large amounts of success from Aqua Force and Shadow Paladin from the previous ARG events as well as continentals now but as a whole, the Vanguard metagame is very diverse. ARG Nationals is sure to be filled with surprises and one must probably expect every relevant match-up to be present. And that wraps up this week, I'm planning an entirely different yet important topic next week, so do be on the lookout for it! I’m always amazed when I see this game is still going. I like Vanguard, but all of the locals in my area have stopped due to lack of attendance. Force of Will hasn’t picked up either so you really just have YuGiOh or MtG to pick from. That’s unfortunate to hear. Luckily Cardfight Online is launching later on this year!